Like most instructors, I'm constantly trying to think of better assignments for various courses. This time around, I'm thinking about my junior level Canterbury Tales course. I'm quite happy with the word paragraph assignment that Sisyphus (at Academic Cog) shared with me a while back. That gets students writing regularly, focusing closely on the text, and makes up about 5-7 pages of writing for the semester. I had a conversation not too long ago with our honors guy, about a student's potential project, and he had an idea of asking a student to find a critical essay and then read everything the paper cited, and then write a paper talking about the critical conversation represented in the original essay. Now that seemed like a great idea, and I started thinking about it in case the student wants to do a project, and then I thought maybe that would work for the longer project for the course. So yesterday, I started looking at crucial essays written in the past ten years about the various tales, and I realized that it's probably unrealistic to expect my students to do that sort of project. For one thing, most of the critical essays cite 40 or so other texts, many of them medieval, some Latin, and many very theoretical (Derrida, for example). They looked like really interesting essays, but my students just aren't strong enough readers of criticism to work with them very well. I'm thinking of using one of them, though, to work with students on reading critical essays, and then building an assignment from there. In the past, I've given students a list of topics and had them do basic lit reviews, and I think I might go with that. I'd love to hear about what sorts of assignments people give for lit students to help them build towards real research skills. I'm spending some time with a couple young adults this break; one is just in college, one a couple of years out. The one in college has matured a lot in the past few months. If I ask hir to do something, it just gets quietly done, not hesitating, fretting, just quietly done. Zie doesn't SEE things that need to be done, mostly, isn't thinking ahead about what needs to be done, but if I ask, they get done, and done appropriately. The younger teen, on the other hand, is way less confident, doesn't see stuff even when asked, fusses a bit (but still, very cooperative for a teen). There's a sort of vague quality to hir doing stuff, even something as basic as mixing pancake batter, which most adults (in my pancake mixing experience) do rather quickly by hand, takes five minutes, and isn't quick at all in hir hands. The younger one gives me that "adults be crazy" look. A lot. I guess what I don't think a lot about day to day but have noticed in interacting with the teens, is that at some point in my life, I went from being that younger teen to being someone who notices when something needs done, who feels pretty capable of getting things done, and who does stuff. It's not that, for example, I like putting gas in the car, but I keep an eye on the gas gauge, plan a bit ahead about getting gas, and get the gas without fussing or worrying. And now, for your viewing pleasure, more snowy owl pictures. It's snowy owl time in the upper Midwest. 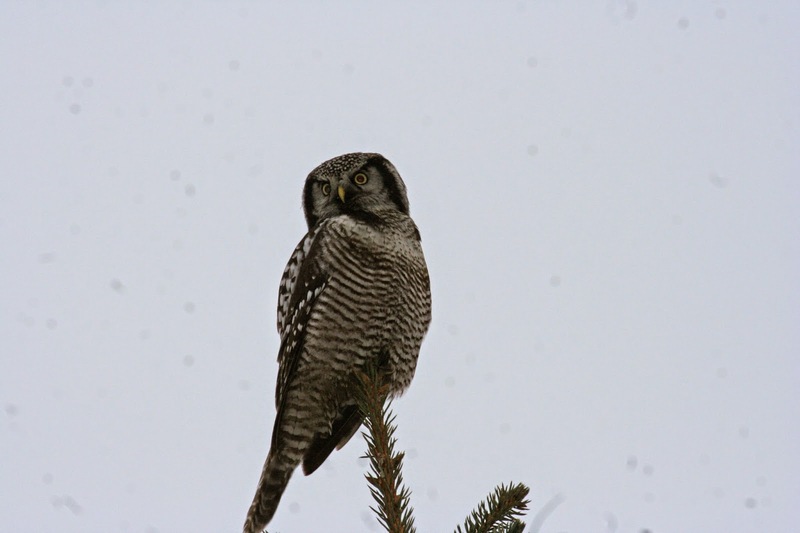 I went out today, and found two owls! I went to the county courthouse today to pay my real estate taxes. Paying taxes in my town is probably a lower key affair than in some places. I walked into the building, was called to the window counter by a worker almost immediately, gave her my paperwork, and so forth. There was a really lovely photo up on the wall, and I mentioned how lovely it was, and the worker said yes, she really liked it, too. And then she mentioned that one of her grandkids, just graduating from college, had majored in photography, and took some great pictures, too. So I said I bet she was really proud, and she told me about some other grandkids, and I congratulated her, and she beamed. My annual visit to the county courthouse done, I went on my way to turn in grades. Paying my taxes sort of marks the end of fall semester every year. Thoughts on "Comparing Living Standards Over Time"
So, the basic question is: would it be better to live on an income of $100K in 1964 or 2014. The article notes that an income of $100K in 1964 was a whole lot, but that you wouldn't have access to some technologies we're all really dependent on now. And then it talks about how if you were asked the same question but the amount was $20K in either year, you'd be way better off in 1964 on $20K, the point it's trying to make being that the technological stuff is mostly available to people who have lots more disposable income, and so the extra income would be better for someone with the $20K then. And then the commenters start to talk. I didn't see anything, not a single thing, in the article about how race or gender or sexuality might affect one's thinking about 1964 vs 2014, and I looked but didn't see a single comment talk about it either. (Okay, I looked down towards the bottom, and there's one comment, from "Honkie Please.") In response, someone comments that of course they're all white men commenting, and that women had it better then than now. And that, that is one of the big things wrong with the internet: it's totally dominated by patriarchal, straight, white, male jerks. Last night was the last Colbert Report. I think we liberal arts folks are going to miss the obvious, beautiful examples of satire Colbert provided. I hope his next effort is as smart and fun. And I hope someone else comes in the slot with great stuff. Death by a thousand paper cuts: why is it when I think I've finished a stack, someone turns in late stuff. Or gets sick and can't take the final. Or has a car problem and can't make it to campus. And why is it that the person who turns in stuff late says something along the lines of, "I'm turning this in late." And nothing along the lines of, "I emailed you about my difficulty, and want to thank you for giving me permission to turn the assignment in late." I'm sympathetic to folks with illness or car problems, but it doesn't mean I like having to write a make up exam. I'm less sympathetic to folks who just turn in stuff late. I've now graded the three biggest, hardest stacks of work. I have (or will have at the end of the day) three more stacks, none of which requires the feedback the first three stacks did. Feedback takes a long time. Assigning a grade takes less time. Because it's easier than grading, I'm thinking about stuff for a class next semester. I'm thinking of doing an assignment where students would read a critical essay, and then read all the work the essay cited. I'd have to do a really good job finding good essays, so that they'd have stuff available to them (so, nothing that requires a reading knowledge of Latin, and nothing that requires a trip to the British Library or public records offices). My last final is today, starting at 3pm. Someone has to get the time, I suppose. Ugh. For the past, maybe 10 days or two weeks, I've had a constant ringing in my ears. Not really ringing, more a steady, high-pitched sound, not horribly loud, but loud enough. It's bad enough that I have a sort of constant low-grade headache and queasiness. After about two days, it went away for a while, and then came back, and it's been steady ever since. I checked the web, and it said that sometimes it's a symptom of high blood pressure, so I went to the mall, and after sitting quietly for a couple of minutes, mine measured at about 125/180, which is higher than it should be, but not scary high, I don't think. I haven't worn earphones or plugs in a long, long time (think a couple years for plugs, and longer by far for earphones). I haven't been at anything really loud. The web site also said that sometimes it's from an aspirin overdose, but I haven't taken aspirin in years. I sometimes have a nightcap, and I stopped that for a week, but the ringing continued. Finally, today I called to try to make an appointment at the clinic. The doctor I saw there before moved a while back, and I haven't been sick since, so I haven't gone, so now I have an appointment to see a new (to me) doctor there, in January. I sure hope the ringing stops before then, because it's irritating. The failure's a bit deeper than that, and comes from my sense of some of the research papers I've been reading this week. The students know they need to cite. But on some level, they don't know why they need to cite. Or, perhaps more to the point, they don't know why they're incorporating someone else's argument so that they need to cite it. As we discussed a few months ago, we cite people's work for many different reasons. But some of my students don't seem to really understand any of those reasons. So they include something about someone else's work in the paper, and cite it appropriately, but it really doesn't contribute to their argument. It's just there. Maybe they think having it there will lend "credibility" to their own argument, but since it's not contributing, it doesn't work that way, even. I've had a couple friends move into various administrative type positions over the years, and a common refrain I've heard is that they were told that "people change towards you." And they tell me it's true that people change towards them. Things just aren't the same. So I've tried to be pretty aware of how I change towards people as they've gone into administration. And I think it's true. Some things I do change. For example, I don't easily share personal problems because it feels like every conversation is "official." And if I share that I'm having difficulty with a class, that's going to be on the person's mind if they review me, or see my application for something, and so on. If I tell them I'm feeling lousy, then the response is all official and not what I'm probably looking for, the sympathetic "gosh, I'm sorry, I hope you feel better soon! Have some chicken soup." So if a friend who's gone into administration feels that I've pulled back, that's a reasonable observation, I think. But what I don't hear from the administrative folks is that they, too, change. For one, they seem to quickly lose touch with the rhythm of the teaching semester. I've had administrative friends suggest I take a week off in the middle of the semester to do a group vacation, for example. The practice faded away because without the common exam we weren't all on campus on Monday, and we're all busy, and about half of us are women who don't have a spouse to obligingly cook and bring our potluck dish, and so on. The new chair decided to bring back the tradition. I think some of the emeriti really missed it. I signed up because I want to be supportive of the new chair, but I'm irritated that I'll have to get up early to get to campus to get parking, spend at least half a day on campus getting far less grading done than I would at home, figure out food to bring (I've done that, at least). Judging from the nudges we got from the departmental staff folks, sign ups were slow. And the sign up sheet wasn't very full when I put my name on there. I think this is one of those things we should let go of, and let us do our jobs without demanding that we socialize on campus, officially. May I also note that it irritates me slightly that the married faculty couples (both in the department) bring one dish, prepared by the female partner. The married men in my department seem largely incapable of turning on a stove or oven; the ones who are married to non-department members always seem to note that their wives made their dish, unless they've chosen to bring cheese on a platter, in which case they may have made the purchase. 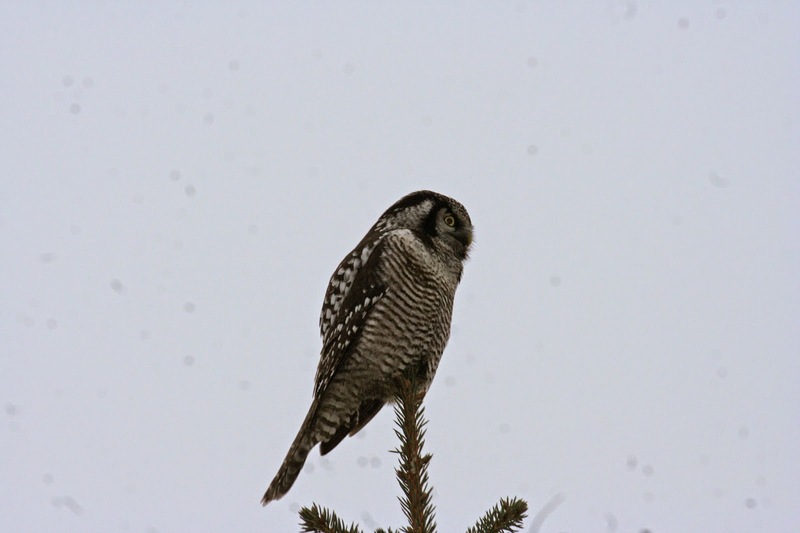 In addition to reports of lots of Snowy Owls irrupting into the upper Midwest, we've got a Northern Hawk Owl! So I took a little field trip away from grading and got lucky! 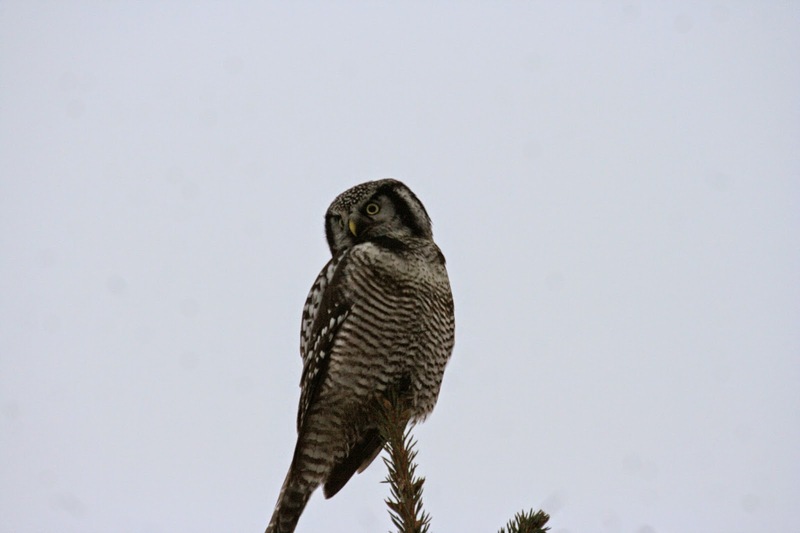 And the owl was very cooperative. I got a polite email the other day from a student enrolled in my Chaucer course who wants to do a special study thing through the honors program so that it counts as an honors course for hir degree; zie asked if we could meet. I looked at the agreement form on the honors website, and it looks like the instructor and student need to agree on something that will make it count for honors. The form suggested that the student might do an extra paper or project, might teach a segment of the course, might do research, or extra journal writing, and so forth. So I emailed the student back, happy to meet, and suggested that zie talk to the head of the program about what sorts of things students did. When zie came in, zie said the program head had basically shown hir the form with its suggestions and that was it for suggestions. I asked hir if zie had interests in medieval lit, or in a specific theoretical approach, but zie said no. Zie thought zie'd read some Chaucer in high school, but couldn't remember if zie had read in Middle English or not. Zie is qualified to take the course, no question. But zie is not so qualified that I can imagine hir coming up with a project beyond what the course will require of all students. Nor does zie seem qualified to teach a segment of the course. I really don't think it's my job to think of a project. I suggested that the student go back to the program director and ask what he'd do if a student who'd taken only a single intro course in Spanish, and were in an upper level Don Quixote in translation course wanted to do this sort of project. In an ideal world, I'd have a lab where I could slot the student to measure some plant growth or something, and that would count for the extra work. But in the humanities world, it's hard to see how to do this sort of thing without it being a lot more work on my part. And unless this student's exceptional (some are! ), it's hard to see the student actually doing meaningful work on Chaucer without a huge amount of extra work on my part. And honestly, I don't see most students being willing and able to do a huge amount of extra work. Some are, and I'm happy to work with them. But most aren't. Has anyone else done a similar sort of thing with humanities? Can I ask for project suggestions? Yesterday, my senior seminar was doing a proofreading exercise on their final papers. The papers were formally due yesterday, too, though I'd said I'd happily accept them until whatever time I left the office Friday afternoon. Indeed, I also told them that while I'm happy with neatly handwritten corrections to proofreading problems, they could also take their work home and make the changes electronically, and then turn in the hard copies until Friday. Still, about a third of the papers got turned in yesterday. A few didn't because there was a proofreading problem the student just didn't want to hand correct. In our casual conversation towards the end of the class session, when I told them that I'd be handing their papers back during the final exam period, and that we'd discuss what they learned, a couple of them commented on how unusual it is to get final papers back, and how happy they are about it. They talked about turning in papers they'd worked really hard on and not getting any feedback or even knowing how they'd done on the paper. They find this understandably frustrating. From the professorial point of view, of course, it's way easier to read the paper, put a grade on, add it to the record, and move on than it is to read the paper, think about what might be useful feedback, give feedback, put a grade on, add it to the record and then move on. It can take me as long to think about and give useful feedback as it takes to read the paper and put a grade on it. Longer, even, because giving useful feedback is intellectually difficult work, often. And, as a professor, I know that if half of my students will never pick up their paper, but I've put feedback on it, I've wasted a whole lot of time. And I can't predict which half. So what a lot of people do (including me, at times) is make papers due during finals, so there's no way anyone can expect to get them back during finals week, and then tell students that I'll give them feedback if they'll come to my office and ask. And very few students do that. The thinking is that it will be easy to give that feedback if they do come, but of course it isn't easy, and I tended to begrudge the time. My solution nowadays is to try to return papers during finals week. But that means I have a hard, hard week ahead. I'd better get to it. The words are from Bourbon, in Shakespeare's Henry V, talking about the impending loss by the French to the English at the battle of Agincourt. I don't think there was eternal shame in losing the battle, certainly not in being a character that talks about losing the battle. But there may be eternal shame, nothing but shame, in the way the US government has tortured captives. Here's the BBC page on the report. I think McCain's right here: the practices amounted to torture, and were shameful. Unlike McCain, I think "unnecessary" really isn't the point. I don't think we can excuse the US government's use of torture even if we assert that the US gained a single bit of useful information. Torture is wrong, and we were wrong to use it. “But in the end, torture’s failure to serve its intended purpose isn’t the main reason to oppose its use. I have often said, and will always maintain, that this question isn’t about our enemies; it’s about us. It’s about who we were, who we are and who we aspire to be. It’s about how we represent ourselves to the world. I'm ashamed because I haven't done something to stop the torture. I still don't know what I could have done, but I'm ashamed that I've done nothing. And I'm ashamed that I've done nothing to insist that the US government not hold prisoners without charging them or giving them a fair trial. We've all known about Guantanamo and the torture for years. Let's not lie to ourselves or anyone else about "not knowing." My question is, to avoid shame and eternal shame, what can I, a citizen of these United States, do to stop the government and its agents from torturing and illegally holding prisoners, depriving them of liberty, without charges or a fair, public trial? We, the people of the United States, have allowed the government and its agents to act illegally for far, far too long, to our shame and eternal shame. What can we do to make change? So, for now, I'm sort of waiting for the deluge. I should be working on my SAA paper, of course. Yes. And I am, slowly. But I should be pushing that a whole lot harder. Time to get to that! I guess I really am a midwesterner now. Also, I had a conversation this morning about forcing bulbs. The Underwater Basketweaving Department was having such a lively discussion of assessment today that I could hear it from my 9th story office. All the UB majors choose a submajor, so what may have at one time been considered just "Underwater Basketweaving major" is now the "Comprehensive Underwater Basketweaving" major. And there's also "Creative Underwater Basketweaving," "Technical Studies in Underwater Basketweaving," and so forth. About half the courses that all the majors take are basically comprehensive courses. The "comprehensive" faculty tends to teach pretty much all the students, while only a small subset takes "technical studies" courses, since the technical studies submajor has maybe 15 majors at any given time, and comprehensive has 150. So, pretty much everyone takes one or another senior course in "Understanding Contexts of Underwater Basketweaving" in whatever context area the faculty member does. So, when a deepwater UB historian is teaching it, then deepwater is the context. And so on. The argument seems to have been about this: the comprehensive folks have to assess how the comprehensive submajor program is doing, and the logical place to do this is in the senior context courses, since all their submajors take these. But lots of other submajors take them, too. Thus, if the course is assessing outcome X, where X is supposed to be learned in a bunch of comprehensive courses, and there are 15 comprehensive submajors and 5 other submajors, the assessment is going to be potentially problematic, no? What if in the assessment, the 15 comprensive submajors all do "good job" on outcome X, but the other 5 do "not a good job"? Either they just run the data as is, and find out that they're only doing 75%, and that's not good enough, right? Damned. Or they tease out the data, but then they're told that since the other course is supposed to teach students outcome X (something like, say, piano playing, that's likely to be much better if you've practiced again and again as opposed to having a lesson and thinking you're ready for Carnegie Hall), then they're damned because they aren't teaching the other submajors well enough. Damned. Or they tease out the data and find out that the other submajors do just as well as the comprehensive submajors. Then obviously, those other comprehensive courses aren't necessary at all, and they can just cut those out of the curriculum, and students will "achieve the outcome" with the one course no matter their submajor. Damned. In times of budget cuts, which are plentiful around here, the comprehensive folks are going to be damned either way. And, of course, they're doubly damned because since they're the only courses where all the submajors take courses too, they're also responsible for the whole program assessment. Last month some time, someone administrative from the services side sent around an email requesting that everyone on campus dress in campus colors every Friday. This morning, I saw a little poster put up about it. Folks, I'm an adult. If I want to dress in colors and such, fine. But this semi-official "everyone dress like we're high school students" stuff is just irritating. And yesterday, a faculty member sent around an email requesting that everyone wear "ugly sweaters" or other "holiday" garb, including a list that was very Christian-centered. Also, I'm not Christian. For six to eight weeks a year, I get slammed with Christmas stuff. Last Friday, for example, I turned on NPR in the morning to a Christmas song, and I immediately turned it off. I have no idea why they had a Christmas song playing (between segments, maybe? ), but I just couldn't bear it. And I don't have any sweaters I consider ugly. I've gotten rid of sweaters I considered ugly, but they're no longer taking up my closet space. Why, oh why, are we at a public institution being BSed into wearing Christmas crap? I don't know how to respond. Christians here are so effing repressive that any complaint will be made into a war on Christmas thing. So typically, say someone knows they have to take their kid to some special thing (getting tonsils out, perhaps), which is totally reasonable. Or even if they have a conference (in which case, they wouldn't take a sick day). They send an email out to the whole department asking if people will step up and cover x, y, and z classes on specific days and times. And then, in the tonsils type case, they have something prepped, and the covering person carries that out. As you might guess, the same people generally answer the call, with a small cadre answering often, a slightly larger cadre answering sometimes, and most people never answering at all. You might also guess the gender issues. Fathers rarely seem to need to be with their kids to get the tonsils out. Mothers do. Very few men answer the call (I could name two here that often do, so some are super good). I'm in the slightly larger cadre that answers sometimes. And today is going to be one of those times. I get to go take roll and be the responsible party (see, doesn't that make you laugh?) while the tech folks teach the class how to do some computer programmy thing (it totally makes sense in the context of this assignment sort of thing, even if it sounds wonky). Officially, we take the sick leave (or so I assume, because when I'm sick I take sick leave... but usually that's the morning of thing, so I don't bother trying to get coverage, and even then, only every few years because I'm very, very lucky). The students, it's hoped, don't miss out totally on classtime, and learn whatever it is they're supposed to be learning. There's no sense that covering ten times will get you a notch higher on the merit pay thing, for example. The chair, if zie knows, may be momentarily grateful, but then it's done. Much better to use the extra time to work on your own stuff which may be recognized. I'm just a little frustrated at myself because I really don't want to do this today, but I said I would, and I will, and I know it's sort of going to throw things off the rest of the day. And I'm cranky today because of some stress. Okay, enough complaining. Time to get everything ready so that it doesn't throw off my day for real. How do your schools handle coverage of this sort? Here's the smartest thing I've seen written about Thanksgiving this year. It's worth reading: "On Racism at Thanksgiving." My other course has a final project coming due, but also a final exam, and we're still working on learning new stuff. And that's fine. I did a good bit of grading over the break, and plenty of goofing off, and a few house chores, and it was all in all very good. I'm very happy I didn't travel far. I applied for that thing I mentioned before, the special thing. I'm not hugely invested, which is good, because around here a lot of special things end up being decided long before actual applications are invited, and inviting applications is just a formality. It's one of the reasons we've had a steady stream of good old boys moving up into positions through other positions. NPR this morning is running two stories very capitalistically interested, but so very different. The first is a story about, basically, what a bummer it is for small oil producing businesses that the price of oil has dropped. There's no mention of how that drop makes some other businesses more profitable (those who transport goods, for example), or how the drop helps people who buy gas for their cars. The other is a story about, basically, what a cool thing it is that some folks are buying US produced grass rather than Mexican produced grass, and how the US grass is of higher quality, and now that grass is legal in some US states, the prices of grass have dropped, and that's hurting Mexican producers. My NPR takeaway: It's bad when US producers are hurt by dropping prices, and good when Mexican producers are hurt. It's good when regular-joe people can get grass more cheaply, and unnoticed (read: bad) when regular-joe people can get gas more cheaply. I recognize there are lots of complications to both stories. The gas price drop is, as I understand it, partly driven by frac-sand oil production, which is scarily bad for the environment. And gas being really cheap means people tend to drive more. Pot growing has also been traditionally bad environmentally, especially when it's done illegally. I don't know if it would be better if grass were so legal (and cheap) that it were farmed like soy or something. And then there's the drug cartel problem. That's scary as hell. In a perfect world, run by Queen Bardiac, gas would be expensive enough to incentivize other forms of energy production and use, and we'd somehow find ways to make those forms more environmentally sound. And pot would be inexpensive enough to make farmers need to do math to decide whether to grow it, or hemp, or soy, or whatever other crops they might grow, and inexpensive enough that no one would be willing to go to jail by growing it on National Park lands or by being violent about it. It's time for some holiday music, appropriate to Thanksgiving. Here's a video. You should listen. Really. Here's wishing you a Thanksgiving dinner that can't be beat if you so indulge. I watched the news announcement last night, and knew from the way the man in charge went through things that there'd be no indictment, and there wasn't. The data suggests he was barely exaggerating: According to the Bureau of Justice Statistics, U.S. attorneys prosecuted 162,000 federal cases in 2010, the most recent year for which we have data. Grand juries declined to return an indictment in 11 of them. The article goes on to note that you can't directly compare a Federal and State Grand Juries, but it still gives a sense that it's really rare for a Grand Jury not to indict someone when a prosecutor argues they should. The Nation has an article up about "Why It's Impossible to Indict a Cop." And Think Progress has an article up where "Legal Experts Explain Why the Ferguson Grand Jury Was Set Up for Failure." It's a busy day here, as always, but I'm feeling ignorant and subdued. I really don't understand the Grand Jury process at all (though I've been learning a lot in the past few days). I have a feeling that I'm witnessing, though from afar, one of those moments that's going to be very important in history. Or maybe I just hope that this will be one of those moments where you point back and say, "a big change began as a result of this." I spent the weekend at my siblings, hearing one of the kids play a concert. I'm supposed to go there for Thanksgiving, too. But the drive beats me up. It's not horrible, but it's long enough that I want to relax after, and not do work. But the work needs to be done. My in law and I were watching a Netflix show (since I subscribe), and enjoying it, and talking about how we could watch more over the Thanksgiving weekend. But then my sibling said that no, the TV would be on football. My in law suggested that there wouldn't be that much football, but my sibling insisted that there will be three games on Thanksgiving, and they will be on, one after the other, on the TV. As I drove back today, going slow because the fog was intermittently nasty, I just felt grumpy and headachy. And when I got back, one of my friends had invited me to Thanksgiving, and it sounds casual and relaxed, and there will be chatting, and laughter, and good potluck food. So I just decided to accept my friends' invitation. And as soon as I did, I just felt so much better. I have no urge to drive a long ways, sit around while my sibling dominates the family room with football on TV, and then drive a long ways home, and hope to get some of the work I have to get done done. Now I have to call my sibling and tell the news. Or call my in law, who's likely to be the only person disappointed, but I know zie will be fine. 1. About two weeks ago, the left turn signal started not working sometimes. It's about half the time, and if it doesn't work, I can flip it again and it will work. Still, it's irritating, and I've been trying to find a time to get the car in. 2. On the way, my check engine light went on. It's done this before, and the car repair people say not to worry about it. Why have the light and then say not to worry? I do worry. 3. I discovered that one of my rear brake lights is out. 4. My CD player isn't working. It's got two CDs stuck in there (it holds up to six), and it won't do anything now. That meant instead of listening to a book on CD, I had to find radio stations to listen to. There are WAY too many religious and country stations for my taste, and way too few rock stations, and no Spanish language stations that I can find. 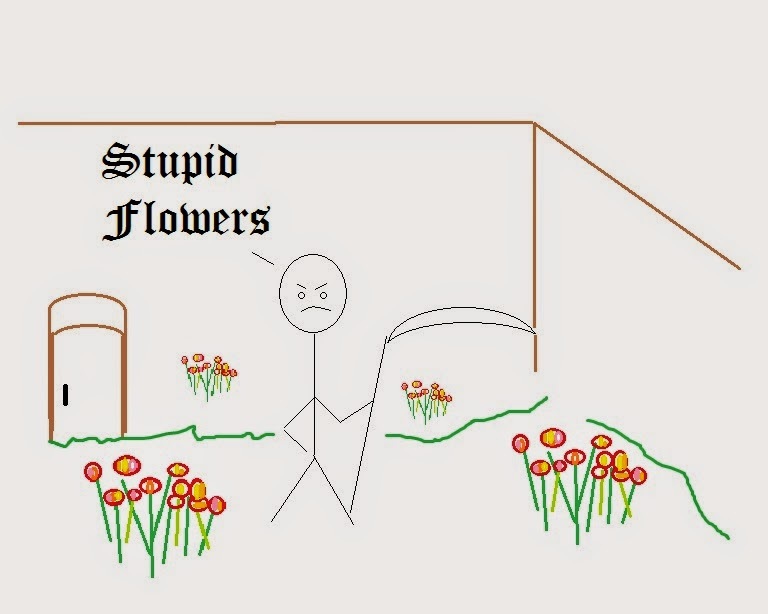 It's been a long time, but here's a stick figure lit quiz! What's the text of the day? And the next question: why do my students hate it so much? I visited a colleague's class on Friday as part of the personnel review process. It was really good. There was smart conversation about some interesting texts. When I have classes go that well, I feel pretty darned good about things. And tonight, I'm prepping to fill in tomorrow for a different colleague who's ill. Fortunately, it's comp, and we're all supposed to teach comp in basically the same way using the same basic program. Frustrating in some ways, but it means that there's a shared vocabulary. And, theoretically, if someone walks into my class on a given day, they should find themselves in familiar territory, and within a few days, give or take, of their own class. That is, at this time of the semester, we're all doing the Blue Project, and probably finishing that up and starting the Green Project. So, my class has peer editing its Blue Project, and has the assignment for the Green one, and we'll begin working on the Green while they put the finishing touches on the Blue and then turn it in. Voila. Except the course I'm filling in on tomorrow seems to have cut one of the projects completely. I don't really know what's up (the chair and head of comp stuffs do), but it makes me feel like my own abundant inadequacies with this comp program aren't quite as inadequate as I sometimes think. In other news, tomorrow is the anniversary of a VERY big day in history. Or at least it was big when it happened. It's also the anniversary of a mildly famous concert which became, in one form or another, the name of an album that contributed to a rock and roller's rise to fame and fortune. Anyone want to take a shot at the anniversary game? Back in the stone ages, when I was a student, it was pretty common to have class MWF from 3-4. And not unheard of to have a lab on Friday from 2-5, even. It was common enough that the Geology department had a legendary course, Geology 500, which met every Friday at 5pm for departmental beer and chat. In more recent times, Thursday has become the new Friday, and around here, at least, it's rare for us to have a class on Fridays that goes later than 2pm. I taught a MWF 1-2pm course last semester, and the classroom wing was nearly empty except for me and my students. I feel the urges, too. Most of us in my department can manage a "non-teaching" day during the week, working around our usual 11 credit hour load. For folks on a MWF basic schedule, that usually means you choose either Tuesday or Thursday for the "non-teaching" day. Folks who teach most of their classes on Tuesdays and Thursdays usually choose either Monday or Friday for their "non-teaching" day; there are times when you can manage both, or sometimes one and Wednesday. It's easy to see the appeal, isn't it? Students, too, like the same scheduling, often. That's especially true for students who try to fit a whole week of work into four days, Friday, Saturday, Sunday, and Monday, to support themselves while they work at classes on Tuesdays, Wednesdays, and Fridays. Or some of them like to "go home" a lot, and plan their schedules around those visits. Or whatever. I think there's been a mutual movement, with faculty and students both wanting more Tuesday/Thursday courses, and fewer courses late on Fridays. Yesterday, I was advising a student and talking with him about what courses to take in the coming semester. He's in a fairly rigid program, and has to take certain set general ed type courses. So, he'd filled in his schedule, but was on the low side of credits for the semester, especially if he wants to graduate in a timely manner. Monday afternoon, late, three hours, upper level option for major. Tuesday / Thursday, starting at 9:30, running three straight courses. Every single course he needed, except for the Monday afternoon course, was only offered during those three prime slots on Tuesdays and Thursdays, starting at 9:30. We looked at options for general ed courses, all T/T in the three prime slots. We looked at program courses, all T/T in those prime slots. So I looked. And out of 40 some courses in my department from sophomore level up, only 10 are on Mondays, Wednesdays, and or Fridays. (Some are a late evening one day a week, and I counted those). I think we (including me) have done ourselves a world of hurt this semester by scheduling so many of our courses against each other. In budget-driven times, I wonder if some of our courses are going to be cancelled, and those of us with contracts will suddenly be teaching more comp or something. Here are my fingers crossed for decent enrollment in my Chaucer course! Part of the problem Johnson notes comes in what gets assessed. If we assess Pattern Regularity in Deepwater Basketweaving, and not Basket Shaping, then faculty folks are going to be forced to focus on pattern regularity, and the basket shaping parts of the curriculum are going to fall by the wayside. And the faculty may, given the mandate to choose to assess something that can be measured and proven, choose to assess pattern regularity, rather than basket shaping, just because it can be measured. A regular pattern may mean nothing without a well-shaped basket, of course, but we can't assess every single thing we do, because we do a whole lot in any course, so what gets assessed is going to be what can be assessed most easily because it can be measured. Business folks are all about how you have to be able to measure something in order to manage it. That's easy if you're measuring how many widgets get produced, but considerably harder if you try to figure out the quality of different foods cooked in a restaurant, or even more, the education of a student. If you measure food quality by taste, then that's one thing, but if the consumer gets horribly sick from food poisoning four or five hours later, then the food quality was bad no matter what it tasted like. That won't make it onto the survey at the end of the dinner, though. Education is even more complicated because many people won't really gain an appreciation of their education until they've been out of college for a couple of years or more. And some students won't put things together fully until they've had a chance to mature a bit. Let's face it, Jane Austen in your 20s is good; Jane Austen in your 30s is WAY better. It's not Austen's quality that changed, it's the reader. Johnson also talks about the dismissive ways administrators talk about faculty when they talk about assessment, as if faculty are recalcitrant children. The comments to Johnson's article are also useful and telling. Over at Confessions of a Community College Dean, the Dean reads Johnson's article and talks about how difficult assessment is to do when there's no obvious capstone (as in most community college programs, especially those intended for transfer). One thing he talks about is that his college has an assessment committee made up of people whose workloads are adjusted so that the assessment work counts, and those people read assignments and make recommendations to their colleagues. If you've read here for a while, you've probably gathered that I have a negative attitude towards assessment. Reading the two articles has made me think about why. So, here, in no particular order, are some reasons I'm negative about assessment. 1) It's not actually about student learning, but rather it's always about accreditation, and especially about accreditation on a sort of business model, which sees us as turning out products (we call them "students" but assessment measures products) and asks how much value we've added as the products pass through our system. When we're told, as I've been told lo these many times, that we have to "assess ourselves or someone else will 'do it' to us" with the "do it" being characterized in somewhat violent ways, that's coercive. And it doesn't help me be a better teacher. 2) What's important can't necessarily be measured. And what can be measured may not be all that important. If you want to measure that students can learn how to think critically by taking courses that ask them to think in different ways, to learn about thinking, and to solve problems, how do you measure critical thinking? You don't do it by telling students that you're teaching them critical thinking and then asking if they know you've been teaching them critical thinking. I have a colleague who thinks I should write down all the goals for a semester long Shakespeare class so they can be measured. I could begin, but the list would go on and on, everything from thinking about how racialized thinking in early modern culture contributes to our own racism, to how playhouse structure matters in theatrical experience, to ... well, I don't even want to go on. How do I measure those things? Some students will learn more, and be able to integrate what they've learned about race in US history, and something good will happen. Other students in the very same class will deny that race can even matter because they think we're post-racial somehow. 3) Administrators communicate that they think faculty have never ever in our lives thought about teaching, and can't even begin to think about teaching until we've been taught the official language of assessment-speak. It may be that some few faculty never think reflectively about what the heck they're doing standing in front of 30 or 200 students, but I've never met a single faculty member who didn't talk as if they thought reflectively. 4) There's an ever-changing target, and it always involves a lot more work for faculty. I recently wrote about spending hours in department meetings figuring out how we were going to apply for our courses to move from the old general education to the new general education system, even after we've all been told that the new system was specifically designed so that the top 70 courses from across the university would be the same top 70 courses in the new system. That is, the system is designed to be almost exactly like the old system in everything but names. We fill out the forms in good faith, spending hours to get the language just as the committee has told us it wants, and then the committee comes back and says that we have to do all those forms differently because what they said they wanted isn't it after all. 5) There's an ever-changing target because the folks who claim to be assessment experts have little idea about what they're doing, and so keep constantly coming up with new ways of figuring out how to measure students as products because students as products aren't measurable. I've been through assessment systems based on: portfolios, exit interviews, "embedded" assessment, and on and on. 6) It takes an administrator just a few seconds to demand hours of work from faculty and staff in any department, and none of that work seems at all helpful to our teaching. Time is not flexible, not really. If 20 people in my department spend an hour in a meeting working on assessment stuff, that's an hour we could be spending another way, and 20 hours altogether, which is half a work week for normal employees. That's it. I have to work on some stuff that actually may be of use to my colleagues. My pal over in Underwater Basketweaving needs to write the basic thank you letters to the people who served on their deepwater search. It's a basic thing, partly to acknowledge the extra work these folks put in (extra work anyone on a search puts in), and partly to make sure that they get something for their file, which can be important for tenure and promotion and such. For that purpose, the UB person always CCs the chair. It just means that a copy goes into the personnel file, so that folks can see it if they look. But this time, my UB friend says he wants to also CC the dean because he wants to make sure that the dean is aware that her decisions matter, that her putting off the decision meant that people did work for nothing, more than they would have if she'd made the decision two weeks ago, or if she'd not given hints that the search was going through. While tempting, perhaps, this seems like a bad idea to me, and I've told him so. Budgets are being cut again here at NWU; supposedly our beloved state had budget problems, and the state university system is where such problems get balanced. We're running pretty lean here, but cuts are happening, and more are on the way. Word is out that each department chair is having an individual budget meeting with the Dean, and getting the word on cuts, and the word is painful. So says my friend who had her meeting already. The bad news in Underwater Basketweaving is that their job search for a Deepwater Specialist is cut. They've sent out letters to all the applicants, more than 100 of them, explaining the search's elimination. And all that time faculty put in, staff put in, to prepare and start reading the applications, all that time is gone. Why didn't the Dean make that decision a month ago? Instead, the signals the basketweavers got was full steam ahead, until it wasn't, and then it was a complete turn around. Not a complete surprise, because everyone knew it was a possibility, but a turn around. If the Dean decided a month ago, then that would have saved faculty time, but also the time of 100 plus candidates, all of whom spent (in all likelihood) a goodly bit of time preparing their letter for the UB department's ad. But. I'm not supposed to know. Yes, the cancelled searches seem to be being kept secret; I only know this one because I know the staff person who had the unhappy duty to send out all the cancelled job letters to the applicants. It seems to me, the secrecy thing is really unhealthy. We're in this together, and we should all learn in a timely manner of decisions that affect us, shouldn't we? I've finally (after at least a decade) get to teach Shakespeare at the upper division level! Our lower division Shakespeare is a genre-oriented survey type course. The upper division Shakespeare is a theme-oriented course. So, now the question is, what theme? I'm thinking of a couple. I have a secret goal, too, which is to teach the last of the Shakespeare plays I've never taught before, Timon of Athens. So, what themes sound fun? In part this is prompted by everyone's sudden interest in producing graduating widgets at the fastest rate possible. At any rate, we're supposed to measure output using criteria we develop ourselves, and then prove to the Committee for Professional Output Optimized Performance and Institutional Excellence that we've measured the output so that they can prove to the accrediting organization that we've measured and are putting out the output we claim we're outputting. And now all the stuff is phasing in. Right. Last year, the Committee for POOPIE requested that all the "bigger" courses (that is, the courses that served the most students overall) that had previously given general education credit under the old system be put through a process to request POOPIE credit under the new system. The new system has different categories. One is content, or C. There's content that's math, and content that's science, and content that's historically oriented, and content that's artistically oriented, and so forth. That is, we have CM, CS, CH, CA, and so on. There's a Social category, or S, for getting students to learn about civics and so forth, with three subcategories, organization, action, and international, so SO, SA, and SI. And then there's the Practice category, or P, which include writing (PW), arts (PA) and so on. The Department of Underwater Basketweaving duly (so my contact reported) spent many hours of department meetings deciding which categories to apply in. "Intro to Understanding Underwater Basketweaving" folks applied for CH and CA POOPIE categories, because they study both the history of underwater basketweaving and the artistic aspects of underwater basketweaving. "Social Underwater Basketweaving" folks applied for SA and PA POOPIE categories, because they make baskets and teach about how underwater basketweaving is social action, because the personal is the political in underwater basketweaving. Intro to Underwater Basketweaving Reed Cultivation" folks applied for CS and SA POOPIE categories, and so forth. From what I heard from my Underwater Basketweaving friends, many hours of brainstorming went into these discussions. Over the years, the department has developed lots of general education courses to serve the university, so they had a number of courses to do applications for, and a number of them applied under CH and CA POOPIE categories. And sent them off for review in April and May, as required by the Committee on POOPIE. And now, this year, the Committee on POOPIE is meeting regularly to decide which categories of POOPIE each course is going to qualify for based on the applications put forward by the departments. And now, they've apparently decided that no single course can teach two Content categories (or two Practice categories, and so forth). So all the courses that had put forward as CH and CA (a fairly common request in the Underwater Basketweaving area, because the courses teach an art form and often historical contexts for the art, and so forth) have all been rejected, while the courses requesting SA and PA POOPIE categories have been accepted. Why didn't they tell departments across campus last year that no course would be allowed to claim it taught both CH and CA content? If they had, departments across campus would have decided during all those hours of brainstorming and work which they'd apply for, and not spent time needlessly trying to word things just right in both categories. And thus ends my tale of woe. Or, perhaps, tail of woe? I was reading through effbee posts this morning; one of my friends, a native upper Midwesterner whom I'd met in a big coastal city, and who's since moved to another not quite as big coastal city, had linked this article by Darcey Steinke on Salon about "Growing Apart on Facebook" (Link). Mostly the article's about how Steinke moved from a smaller, Southern community to NYC, but finds the Facebook connections to her old high school friends at once alienating and thought-provoking. All our mothers were discombobulated. They’d been raised to be housewives, but the new culture insisted they get jobs and personal checking accounts. Seventies culture glorified working women like Mary Tyler Moore and Hill Street Blues’ Joyce Davenport. Our moms had become outmoded, female versions of Willy Loman, with a skill set no longer valued. I read that, and my brain went, "yes, exactly." I'm often frustrated by my Mother, but I've never quite put the frustrations together like this. I'm thinking now about how difficult it was to grow up, and have all these expectations about how the world was supposed to work, and then have your kid (me) adore Mary Tyler Moore (I fantasized about being able to have my own studio apartment someday because that seemed to me the greatest heights a woman could aspire to), and have that same kid pretty much reject the life you were leading. Now, my Mom sometimes seemed pretty unhappy in that life, stifled, but still, she also seemed happy much of the time. A few of our mothers went to work or back to school, but most of them, disoriented and threatened, put even more pressure on us, their daughters, to be traditional, to define ourselves through boyfriends and, later, husbands, to hold our looks as our most valuable asset and to uphold the sanctity of the traditional home. And that's where my Mother was different, because even though she was uncomfortable, and even though she would have preferred me to want to be traditional, to marry and be a stay at home mother, she completely supported my going to college, and joining the Peace Corps, and all the other crazy stuff I've done along the way. She's proud of me, even as she's hurt that I've rejected the sort of life she led, and even though she often seems to feel that my rejection is a condemnation of her. As someone who grew up, as I did, with names, familiar in my mouth as household words, Willie Mays, Willie McCovey, Juan Marichal, Jesus Alou*, I should be pretty happy about last night's World Series win by the San Francisco Giants. I'm happy for my relatives who are in the Bay Area and care about the sports teams. Other than that? I watched only the last inning, and that more by accident than design. So I can't say I was really invested. Winter is coming on, and with all this, I'm feeling very dislocated. I'm not getting outside enough, just going to work in the near dark (already) and coming home just before dark most days, and I'm feeling the cold in the way we do in the fall, when 40 feels so much colder than it does in the spring. Work is overwhelming, but I need to find a way to make time to get outside at least a little, and to be warm while outside. And my yard, my yard needs so much cleanup right now. * I remember pretty distinctly the first time I learned to read Jesus Alou's first name. I guess in my little kid way, learning to read in a monolingual English speaking household, I'd thought his name would look like "Haysoos" or something, something totally separate from the word "Jesus" I'd seen in church stuff. It probably says something about my parents that they were totally okay with me wanting to grow up to be Willie McCovey when we played streetball on our street and I always wanted to play first base. Today was one of those days when I had a lot of stuff that needed to be done. I had a stack of papers to finish grading, and sample papers to find to show students to their project. And for the third class, I needed to prep a different text I've never taught before. I have a big list things to do tomorrow, but it feels more manageable with the big stack of papers graded. I love having graded a pile. I'm liking the journal list thing I wrote about here. It's working helpfully for keeping stuff in mind without having to rewrite the list and such. And having the stuff all together, a day list, a longer term project list, it helps. I'm also putting some brainstormy type stuff there, too. NPR is running a story today on the 100th anniversary of the birth of Jonas Salk. I'm old enough to remember being lined up as a kindergartener and everyone getting a sugar cube with the polio vaccine (which was the Sabine vaccine, I realize). I'm of an age where I remember no one from my generation having polio, but one of my aunts had had it (and survived, not too badly affected). Thank you, Jonas Salk. And thank you to all the researchers who developed vaccines, and all the kids who were tested, and all the parents who enrolled their kids to be tested, and to my parents who made sure I was vaccinated, and to my school district that made sure we were all vaccinated. Yep, I got my flu vaccine for the year a couple of weeks ago now. I don't think I've ever had the real flu, and I'm fine with missing that experience! For the fourth time today, I had an expert skype in to talk to one of my classes. Three experts, four visits (because one was kind enough to skype twice). It's really cool, especially for this more advanced course, because the experts are people whose work we're reading, and the students get to see these folks as human beings, thinking their way through questions, asking the students questions, thinking together. Each time, the students have been quiet, sort of shy, especially at first. But each time they've also talked afterwards about how much they learned, and how cool it is. It's like Star Trek or something! From across the country! There's a link on my effbee feed to an interview with Norman Lear about All in the Family. One of the clips shown is of Jean Stapleton, who played Edith Bunker. Now I remember watching All in the Family, and Edith Bunker seemed pretty old. But seeing that clip, she looks young! So I looked, and when the show started, she was in her late 40s. First, how does the US have jurisdiction over murders that happened in Iraq or Afghanistan? The Blackwater men were tried here, and now the news says the US is bringing a Russian national who fought with the Taliban for trial in the US. Also, I don't understand someone coming back to the US after having worked with Ebola patients, and deciding to go ride the subway and go bowling and such. Wouldn't you say to yourself, "well, self, I think I'll hang out in my apartment for three weeks, just to make sure, and contact the rest of the world via email and the internet. And ask a friend to drop groceries by, but not come in." It just seems like that would be common sense, doesn't it? You don't think you'll get sick, and you sure hope you won't, but since it's a pretty serious disease, and since the subway has lots and lots of people, wouldn't you just think that staying to yourself for a couple weeks was do-able, and going bowling wasn't really necessary? I'm thinking of applying for this special faculty position here. I might be a stretch. But again, I might not. I need to talk to some folks. I'm sure I've seen these for years, but this semester, things seem to be ramping up. Basically, someone makes a poster of some sort to advertise a course they're teaching in a coming term. We do these pretty officially for courses taught in terms that aren't fall or spring semester, but the other day, one of my colleagues handed me a BIG yellow piece of paper with a description of his course. I happily put it up on my door. But it got me thinking. Then another colleague stopped to chat in passing and said he was going to make a poster for a class he's teaching. I got to thinking, and then I powered up the powerpoint and made a small poster (just a black and white) for my Chaucer class. So there! It feels strangely like competition where there really shouldn't be competition. A poster is a poor reason to choose a course. But maybe someone sees a course listed and doesn't know what it will be about, and a poster tells them, and they realize they might find the course interesting? That seems like a poor excuse for having jumped on this particular little bandwagon. On the other hand, I learned powerpoint basics years ago, so at least it didn't take me long to put together a small poster. Do you put up posters? Are they part of your institutional culture? Do you think they even work? I'm teaching a course this semester on ecocriticism and early modern lit (as I posted here). It's a learning experience for me. We spent the first few weeks reading ecocritical theory, and now we're reading early modern texts paired with a critical text. I'm really enjoying this class and learning a lot. I hope the students feel like they're learning as much, and also enjoying it. One of the cool things is that when you start thinking theoretically about something, you suddenly start to see things you hadn't noticed before, start reading differently. I'm really enjoying that about reading some texts I've read and loved for a long time. This feels like a really fruitful area of inquiry. Is it just here at NWU, or is it everywhere? Our English Ed folks always seem to want to teach literature. Ask them why they did a doctorate in English Ed, and they'll tell me that they were aware of the horrid prospects in lit, and so chose English Ed. And they're right: my school starts English Ed assistant profs at about what associates in lit make. But then they'll say that they want to teach lit, and they're totally qualified to teach whatever it is in lit that strikes their fancy... because they taught it in high school. I'm writing some thank you notes in my official capacity as a committee person, trying to draft these so I can get some input from other committee members before I send them out officially. But yesterday, I started reading a new novel, Dear Committee Members, by Julie Schumacher. First, I was sitting waiting to pick folks up in an airport, and kept laughing inappropriately loudly, but I couldn't help myself. And here in the upper midwest, loud laughter in public is pretty unappreciated unless you're a white male, drinking, and watching your local sports team or something. At any rate, I got some weird looks in the airport. If you haven't read it, I recommend the novel. And if you have, I wonder if you're reimagining the various letters you write for recommendations or whatever, as I am. I decided to try a new (for me) organizational strategy that I read about (here). I'm hoping that it will help me keep longer term stuff on track better, and inspire me to less procrastination. We'll see. At any rate, I bought myself a little journal book, and that and pen ink seem to be the only financial investments, so at least there's that. One of the interesting bits in the website is that the guy who developed the system (Ryder Carrol, to give credit where credit is due) talks about the journals forming a record of sorts. I'm not sure that I need any sort of permanent record of to do lists and such, but on the other hand, we find Philip Henslowe's account book invaluable, so I do respect that. Part of its value lies in its rarity. If we had account books for every theatrical enterprise in the period, Henslowe's probably wouldn't garner as much attention. I'm pretty sure at least some of the other theatrical companies and such kept some sort of records, but they don't survive. And in all likelihood, even if this system works well for me and I keep at it, my little journal books are unlikely to survive for very long. Nor should they. The system is paper-based, which means as long as the paper survives and the ink is readable, it will survive. So even though paper is pretty easily destroyed in all sorts of ways, if it survives, it's pretty accessible. Digital stuff paradoxically is super survivable and minimally survivable. At least, that's how it seems. We warn kids and students not to put pictures or whatever else might be someday damaging into the internet because we think of those things as coming back to haunt people later, at some distant date into the future. But at the same time, if I wanted to get at files I wrote on a computer just ten years ago and stored on a floppy, the standard of the time, it's going to be super difficult. And I doubt in ten or fifteen years flash drives will still be totally accessible (maybe I'm wrong?). I cringe when I hear someone use the "cloud" metaphor and realize that they don't think it's a metaphor at all. But there's physical, material stuff somewhere that's storing the information in bits and bytes and such, and that physical, material stuff can be destroyed in lots of ways. But unlike my little journal, which I can (I hope) keep track of, most of us have no idea at all where the server farms are storing information we think of as being in "the cloud." Heck, I have no clue where my own campus's servers live, even though I store tons of stuff on my "private" little area there, and trust that the campus folks are backing it up and taking good care so that it doesn't get destroyed. I dug up most of the veggie garden yesterday, harvesting the last of the carrots and the pumpkin. I did leave one kale plant still going pretty well, and expect to have kale salad this evening. I've written here (December 2013) and here (April 2014) about difficulties with an MA student who has moved away and still wants to finish hir thesis. We had contact in April, when I responded to a "full" draft that it wasn't acceptable, noting that the writer hadn't responded at all to my revision suggestions. And the last I heard was that the writer was going to think about whether to finish or not because zie was pretty down and busy and life is complicated. Yesterday, I heard, just a short note asking for clarification about some notes I'd put on draft chapters. (I've received emailed draft chapters, read them and made marginal notes, and then typed up an overall response. I then pdfed the pages with my notes and email them back along with the overall response.) My writing is difficult at best, especially on a pdf. I was able to read my marginal notes easily, even on pdf. BUT, these are the marginal notes I made way back on the first chapter draft, and the student is only now looking at them carefully enough to notice that zie couldn't read them? I'm dismayed. How much does it take to read a 10-25 page piece of writing and respond thoughtfully, trying to be helpful? A bit of time, no? And a bit of energy, no? The email yesterday promised revisions to come soon. We're about a third of the way through the semester here at NWU. First year students are dragging, mostly; I think things are beginning to catch up with them and feel overwhelming. Some of the first years in my writing class are working full blast. Some aren't. I've had six no shows for todays conferences. I'm not sure if they're confused about where to be or what, but I've gotten a lot of small tasks done while I wait. Juniors and seniors seem to have settled in, and where they're interested, they doing really good work. The student I wrote about here dropped by to say thank you today. Zie is fine, thank Dog. I was walking somewhere and saw a colleague from across campus the other day, and we started chatting in the way you do. The colleague mentioned how much zie loves first year students because they're so enthusiastic and interested, and lamented how students seem to lose those qualities by the time they're in her courses in the third year. I recognize levels of enthusiasm in first year students, but I appreciate how enthusiastic and interested my junior and senior level students are. My colleague teaches juniors and seniors, mostly required courses for the major, and occasionally teaches electives at lower levels. About half my load is first year writing, a course that's not on most students elective list; my junior and senior courses are pretty much electives for majors and minors. I'm guessing the elective vs required thing is actually a bigger factor than the year in college. What do you think? I went to a school meeting today and heard the message that we (everyone on campus) needs to do more for more students. It's more planning for a dismal future. We need to accept more students, which means we all need to recruit more students and get them to want to apply and enroll. We need to do this even though the population of traditional college age students is going down. That means we need to recruit non-traditional students, or just more traditional students. And that means, unless something changes and we suddenly become an Ivy, we're going to be accepting students who in whatever parlance you choose, are "less well prepared" to be in college. "Less well prepared" may mean less economically advantaged, of course, because measures of preparedness tend to show a strong correlation with socio-economic status; that is, wealthy students tend to be "well prepared" and very poor students tend to be less "well prepared." And of course, preparedness has nothing to do with being smart, and lots to do with having learned to manage in academic cultures and dominant cultures, and having had lots of opportunities. In addition to accepting more students (and yes, the presenters acknowledged that theses students won't be as "well prepared" as the current population here on average), we need to increase retention and raise four year graduation rates. And, of course, four year graduation rates are also strongly correlated with socio-economic status. Students who have lots of advantages tend to be able to graduate in four years more often than students with fewer advantages. One of the presenters kept basically saying that we need to do all the good stuff we're doing now, but we need to all just get one more student to come and stay, and to get one more student to graduate in four years. But of course, we don't know which is the one student each year, so we need to focus that on every student in hopes of catching one. In other words, we need to do more for more students, some of whom are going to be less well prepared for college than our current students. This meeting came after an hour and a half with a needy student who was unhappy that I sounded unfriendly in responding to hir question about how many issues zie needed to deal with for a project assignment. An hour and a half. It's the job, and I hope it was helpful for her, but it's draining and makes me want to find another job. I have shoveling skills. I wonder if any circuses need a shoveler? I was getting ready to leave campus this afternoon, not long after 5pm, so I went to the women's room as part of the getting ready process. In the women's room, a young woman was sitting on the floor, looking distressed, making a noise that at first sounded like weeping, but then like some sort of breathing problem. I was slow, but she got out an inhaler, and I helped her use it, and then she got out her phone, and I talked to her mom (as it turned out), who said there was medicine in the backpack, but there was no backpack. Then the mom hung up. A moment later, another student rushed in with the backpack, and a moment after that, another student (the first student's roommate, as it turned out). An hour later and she was much better, and we'd taken her to the hospital, and her roommate was going into the exam room with her, and I left (having given the roommate my phone number in case they need a ride home). On the other hand, I'm deeply impressed with the roommate especially, and also the other student. Both were calm and figured out what their friend needed and helped her effectively. The roommate, once the student was breathing better, sort of directed her breathing. And weirdly, I found myself breathing to, and really paying attention to my breathing. You don't usually think about breathing, but sometimes you have to think about it. I wish the powers that be in this state would realize that the people like me, the people they trash in the press, are also people who take care of students beyond our job description. And also, we're people who do a good job at our job. Last year, in October, I posted pictures of the two artichoke plants I'd brought in, hoping to keep them alive for spring. And then in February, I posted about some of the difficulties in keeping the plants alive, and showed pictures of the survival. The biggest difficulty, it seems, was spider mites, which nearly killed the plants. Then I got some spray, and they survived. My friend also gave me a couple new artichoke plants that she'd done the pretend winter trick on to get them to act like they're second year plants and so produce chokes. The problem this summer, for both of us, was that we got few chokes. I got two, one off an overwintered plant, and one off a new plant. She had similar luck. We think (well, she thinks, and she's the expert, so I follow along) that they didn't get enough "winter" to think they should produce chokes (which is to say, to flower). We had a quick, sudden spring, and maybe it just wasn't quite enough for all of the plants. Mine I didn't put out until it was a bit warmer, and her new ones maybe didn't get enough cold. So, here's to another try. This year, I've brought in all the plants. I cleaned them out, took out the leaves that seemed to have spider mites, and sprayed all of them. Right now, they look pretty good. I may have to get another set of lights. These were enough for the two plants last year, but spread out, the light's a bit less concentrated, if that makes sense? As you can see, my deck really needs to be powerwashed! I got little roller platforms, and plastic water things, so hopefully I can water without making a mess all over everything.